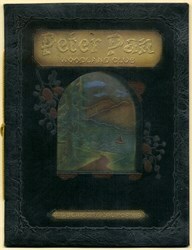 Beautiful book from the Peter Pan Woodland Club Book. 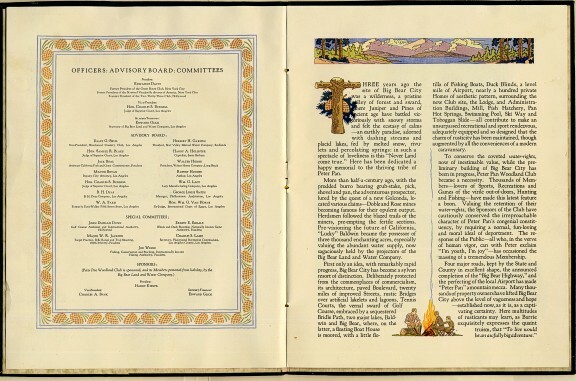 This historic book was printed by the Press of Schwabacher-Frey Company and has ornate pages with picture presentation of projects and personnel with a cover of a beautifully depicted nature scene. 16 printed pages. 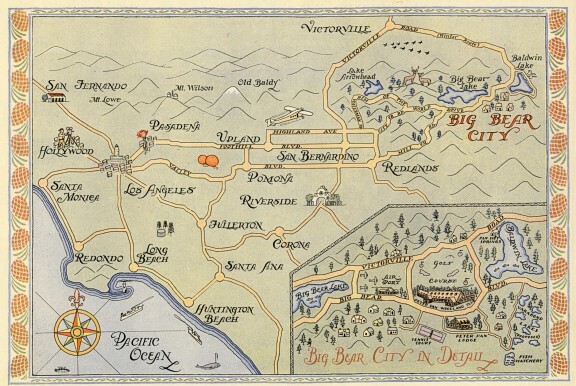 In 1925, The Peter Pan Woodland Club and formed a corporation to develop mountain property in the east valley area of Big Bear City (just east of the present day airport). 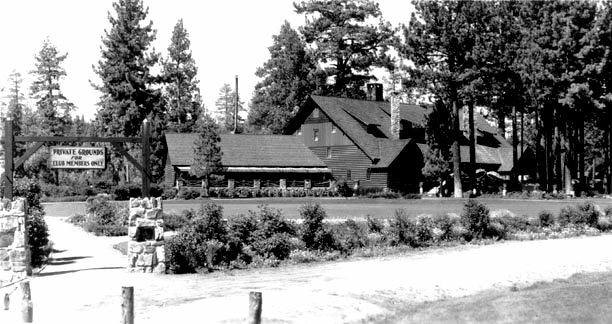 The famed Peter Pan Woodland Club was built in 1930 to promote the new development of Big Bear City. Located just south of the Big Bear airport, the great four-story wooden clubhouse quickly became the showplace of Big Bear Valley. Prospective home buyers were given tours of the clubhouse and facilities, which boasted a golf course, swimming pool, tennis courts, gymnasium, bridal paths and private hunting preserve. Guy Maltby, owner of the Bear Valley Milling And Lumber Company designed and built the huge four-storey clubhouse surrounded by a a golf course, beautiful landscaping, tennis courts, swimming pool, and gymnasium. The symbol of the club was a beautiful statue of Peter Pan sitting on a huge mushroom in the garden. The Peter Pan Woodland Clubhouse was a showplace and host to many gala parties, and was the center of social life in Big Bear City. Several movies used the clubhouse for a backdrop and the club was a favorite with movie companies on location in the valley. In 1948, the majestic wooden clubhouse was destroyed by fire. The smaller Peter Pan Lodge building was moved to the site of the clubhouse and it reopened as the Peter Pan Rancho. The revamped facility remained in business as a family resort for several more years, but it never could capture the elegance of the original resort. In 1925, the Pan Hot Springs Hotel caught the attention of Harry Kiener. Kiener was a developer looking for mountain property to build a real estate development and a major new resort. He decided that the land near the Pan Hot Springs Hotel would be the ideal spot for his project. He named his resort the Peter Pan Woodland Club. Kiener knew it would not be easy competing with other resorts located on or near the lake. If he was going to succeed, he would have to build the most exclusive and expensive resort in Big Bear, and he proceeded to do just that! The clubhouse was a huge four-story structure located at the intersection of Greenway and Country Club. It had a private golf course where Bear City Park and the east end of the airport runway are now located. Lodging at the Woodland Club was restricted to members only and their guests. The lodge's guest register read like a "who's/who" of Hollywood. Members and guests had exclusive access to the club's hunting preserves, bridal paths, gymnasium, and boats. The Woodland Club also had a swimming pool, tennis courts, and its own movie theater. For twenty years, Peter Pan Woodland Club ruled as Big Bear's premier resort. It provided the foundation for the Big Bear City community that sprang up around it. Unfortunately tragedy struck on June 18, 1948, when the club was reduced to ashes by an early morning fire. Pan Hot Springs Hotel was also destroyed by fire in 1933, just nine years after it was built. The Pan Hot Springs Hotel and the fabulous Peter Pan Woodland Club will always be remembered as providing the spark for the community of Big Bear City. History from the City of Big Bear and Wikipedia.